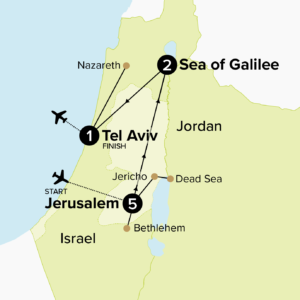 Travel with Cathay Pacific from Australia to Tel Aviv via Hong Kong. Arrive at Ben Gurion Airport where you will be met by a tour representative. Transfer to Jerusalem and check into hotel for dinner and overnight. In the afternoon travel to Bethlehem to participate in the Christmas Celebrations. Visit the sites in Bethlehem and the Shepherds Fields. Enjoy breakfast and then drive to Jericho, known to be the oldest town in the world. Visit the Mount of Temptation and the Sycamore Tree. Passing Qumran, the site where the Dead Sea Scrolls were discovered, continue to the Dead Sea, where you can experience floating on these waters which have amazing healing power and a lot of fun! Return to Jerusalem for dinner and overnight. Today after breakfast we drive to Mt. Tabor, the site of the Miracle of the Transfiguration. Take a boat ride on the Sea of Galilee with time for prayer and reflection. Enjoy a traditional St. Peter’s fish lunch. After lunch continue to “Yardenit” a traditional baptismal site in the River Jordan. Return to hotel for dinner and overnight. Proceed to Caesarea, ancient excavated city with many Roman and Crusader ruins. Transfer to your Tel Aviv hotel for your last night. Please complete a Booking Form online and pay a$500 deposit. No frequent flyer miles are accruable on this fare.